Attending conferences and exhibitions is a great way to promote your business, no matter how big or small it may be. Whatever industry you’re in, there is bound to be at least one relevant exhibition a year you can put a stand up at to get your businesses’ name out there. Creating a stand, and all the marketing collateral to go with it, isn’t an inexpensive exercise – it requires a fair amount of investment. Therefore, you’re not going to want to cram everything into a small storage cupboard once the show is over. There are lots of reasons why you should keep your exhibition material in an off-site storage space. Let’s take a look at them. 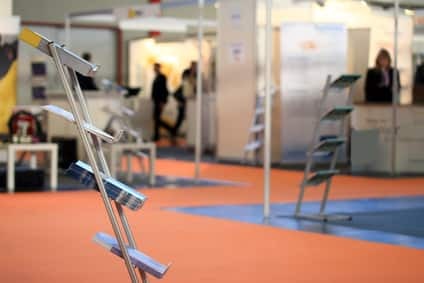 As we’ve already mentioned, the danger of keeping ‘seasonal’ items such as your exhibition stands in the office is that they might get damaged. Most offices don’t have an awful amount of storage space – even if you have a warehouse, the high footfall means it’s not suitable for keeping expensive stands tucked away. The point is, someone is bound to damage your banners, signs and stands if they are not kept in a separate, secure storage space. You’ll also keep your offices storage spaces free from additional clutter! Before you can put it into storage, you’ll need to pack your stands, banners and other marketing collateral away so it’s ready for transport. When you load it into your storage space, it won’t be touched until you next need it for a show. This means your exhibition materials are always packed away and exhibition-ready, saving you precious time. Titan Storage’s spaces are flexible, so you won’t be tied into any long-term contracts and you can change the amount of space you rent at any time. For example, if you’ve got a lot of leaflets and other promotional goodies you need to store before a big event, you can choose to hire a bigger space and then downgrade it once the show is over. If you attend exhibitions every year, you’ll probably want a long-term storage solution, but if you are only after something short-term, we can provide this too. You’ll only ever pay for the time you’ve spent at Titan Storage – just give us two weeks’ notice before you move out. Those stands are valuable, so you want to ensure they are safe and secure wherever they are kept. At Titan, we have state-of-the-art security systems in place. Our facilities are monitored 24/7, 365 days a year by CCTV and access to the upper floors is restricted by a key-coded lift. Your space itself is secured with a unique padlock – your exhibition materials couldn’t be safer. It doesn’t matter if it’s 3am on a Saturday night or 1pm on a Bank Holiday Monday, you can access your storage space at any time – just use your key-code and padlock key. You can also give other members of your team access. Let the store know who else needs to use the storage space and they will be given their own keys. That way, if one member of staff is off sick or not able to attend a trade show, someone else is able to access the equipment. Our business storage solutions are ideal for storing all sorts of items, not just banners and stands. If you’re renting a space for your exhibition and marketing materials, you may as well use any leftover space to archive sensitive documents or keep seasonal stock out of the way. The only thing we would advise is to ensure everything can still be accessed easily, especially your exhibition items. If you need a bigger space, feel free to upsize! If you’re looking for a cost-effective storage solution for your marketing collateral, look no further than Titan. Click here to get a no-obligation quote, or give us a ring on 0800 644 0018 to find out more.